Due — Reminders, Countdown Timers App Data & Review - Productivity - Apps Rankings! Due — Reminders, Countdown .. Type "Make dinner reservation at 9am tomorrow" and your reminder is set for 9 AM tomorrow. "Cancel subscription in 1 month" and you get a buzz a month later. There are no awkward date pickers to fight with, nor rigid date and time format to follow. Your reminder is set as soon as you're done typing. Due makes sure things actually get done by keeping you on your toes, sending you periodic reminders until you actually mark the reminders complete. 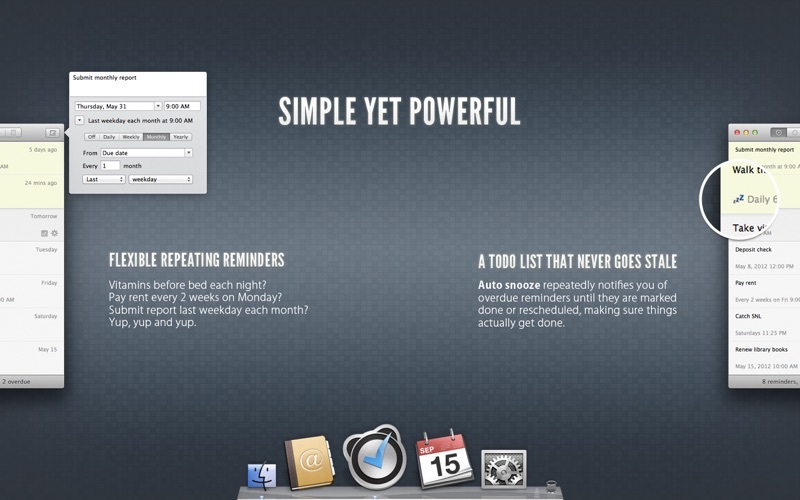 The super-fast reminder app on your iPhone, iPad and iPod touch—now on your Mac. * Natural date and time parsing available for non-recurring reminders only. Reminders are set as soon as you finish typing what to do, and when to do it. "4pm" works just as fine as "4:00 PM" or "16:00", and "Aug 22" works as well as "22 August" or "8/22". Relative dates like "in 20 mins" or "in 6 months" work too. - "Collect passport next Monday 4pm"
- "Make dinner reservation at 14:00 tomorrow"
- "Cancel subscription in 1 month"
- "Wish Sally happy birthday on Aug 22 at 8 AM"
- "Phone contract expires May 30 2014"
Due repeatedly notifies you of missed reminders until they are marked done or rescheduled, making sure things get done and your list never go stale. Power users can skip the mouse and trackpad. Show or hide Due, create reminders, reschedule them, mark them complete, delete them. Everything you need is a keyboard shortcut away. Precise to the second, they are perfect for timing your coffee, tea and eggs. Set them up once and reuse them forever. Vitamins before bed each night? Pay rent every 2 weeks on Monday? Submit a report on the last weekday of the month? Yup. **Sync on iOS requires Due for iOS (sold separately). 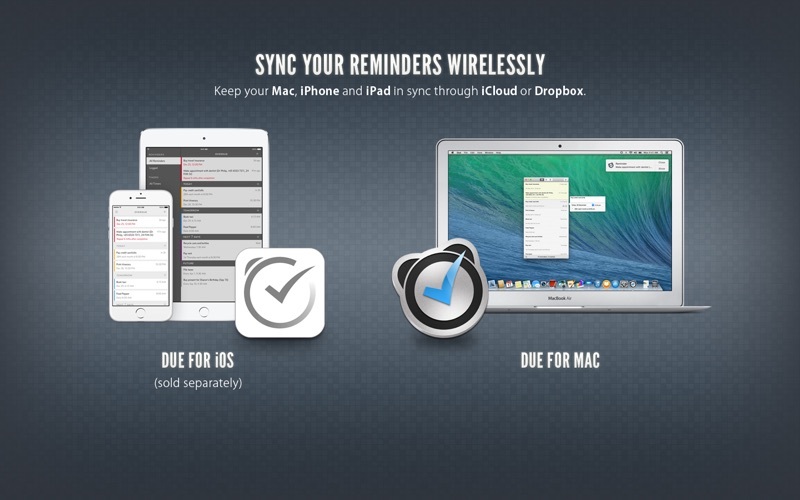 With Due for iOS 2.0, your iPhone and iPad can sync in the background using Dropbox or iCloud. Search your reminders and timers. And if you don't find what you want, press Return to create a reminder with your search term. Create reminders by dragging emails, calendar events, text, links and more to Due. Send your friend a reminder via Mail, Messages or Twitter by dragging or copying it. It even comes with a link so that he can add that reminder to his own copy of Due. Run Due directly from your menu bar, badge it with unattended alerts, and take Due off your Dock if you like. Assign distinctive alert sound for each reminder; louder and longer ones for important reminders, and subtler ones for less critical reminders. Customize how notifications behave—whether they display a notification, play a sound, bounces the icon or highlights the icon in the menu bar—when reminders and timers become due. Requires Mac OS X 10.10 Yosemite or later. Email [email protected], or choose Help > Send Feedback… from Due. Follow us on Twitter @dueapp. The applications Due — Reminders, Countdown Timers was published in the category Productivity on 2012-05-15 and was developed by Due Apps LLP. The file size is 17.89 MB. The current version is 1.5.1 and works well on 10.10 and high ios versions. Syncing with iCloud is now more reliable, and way faster than before. Powered by CloudKit, your iPhone and iPad can now sync in the background when using iCloud sync. To continue syncing with iCloud across your devices, please download the free update for Due on your iPhone and iPad. Due now syncs your reminders up to three times faster than before, all thanks to the all-new JSON database format. - Updated Dropbox sync to version 2. You should no longer be seeing conflicted sync files and Dropbox file change notifications on your desktop when Due syncs. - When editing a reminder, Due no longer scrolls to the position of the edited reminder. Do you like Due — Reminders, Countdown Timers applications? Please share! I like this as a phone app. Simple is good. But it is just too simple and frankly, ugly, for the mac. If it looked and functioned more like the ios app, it would be better. Well, I bought thinking it could handle subtasks like a normal task manager, but to no avail. My bad for assuming a $10 app could perform an expected function. Wish refunds were allowed. 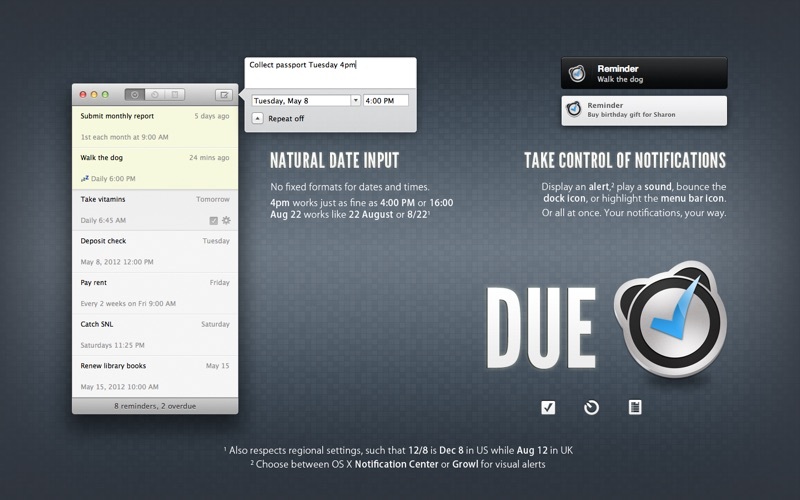 Due has become one of my must have apps for my iPhone as well as my desktop. What I most appreciate about this app are its’ many features. You can select alarm sounds, repeat items, sync with the Desktop app and for those who like me are very busy you can snooze alarms using presets. As someone who is not only very busy with many tasks but ADD this app is a real asset to my productivity. Before getting this app I would set reminder alarms and when I was very busy turn off the alarm trusting myself to remember to complete the alarmed task when I finished my current work. More often than not I would forget to do the task that I had set an alarm for. Due’s easy “Snooze” feature solved that problem. On MacOS, needs a better design Mayliz T.
I like the concept of this app and it works well on my iOS devices; however, on the Mac, there is not division between the tasks. It simply looks like a laundry list of things to do. I would prefer it to look more like it does on the iOS version with divisions for today, tomorrow, next week and future. Sync is slow and sometimes unreliable. Alarms are sometimes missed. Natural language parser parses "today" as "a year from today." It's nice to be able to quickly make reminders while at my keyboard. 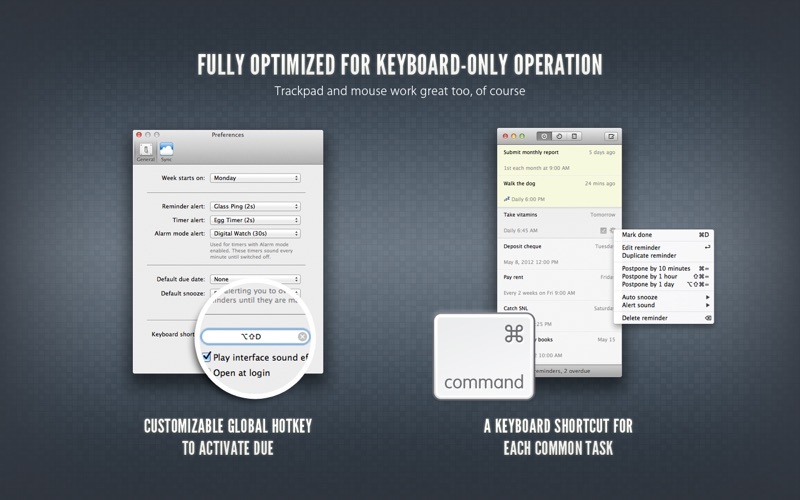 It's faster than fiddling with an iphone, esepcially when already in the "hands on keyboard state." I'd like Due to handle entries using 24hour time. That's what I use on my Mac and iPhone. So it's a bit tricky to remind myself that 7:00 to do something and it comes up at 7PM. Synchronization works fine. No major problem otherwise. I’m a new user of Due, and I’ve given it four stars because: a) the simplicity of adding tasks means that I’m likely to record them, and b) the reminder function is persistent and works. All that said, I’m also experiencing a few annoyances that might be correctable, but support by the developer is lacking. For example, every time I modify a task I receive a notification on my Apple Watch that a task has been modified. I could simply turn off the Watch reminders, but then I’d lose some of the functionality of Due. Perhaps there’s a setting I haven’t yet discovered. Or, perhaps this is an easy fix by the developer? Bottom line is my note to the developer has gone unanswered, and I’m really frustrated by a few of these items. If the developer were more engaged, I think this could be a killer app, and I’d have given it 5 stars. Good app, good syncing. But it needs to more closely resemble the outstanding iOS app, with sections for TODAY and TOMORROW and NEXT 7 DAYS. Also, pop-ups are *okay* but I’d rather have a wider window with expanded columns. I’ve used Due for a long time and it has always worked well, but he visual design of the Mac app is really dated and it’s getting hard to look at. I wish they would refresh the visuals like they did for the iOS app a long time ago. I’ve enjoyed using Due for a good long while. Extremely handy. I use OmniFocus for lots of my task management, but there are some things that need to get done and you want them to keep reminding you (at a period of your choice) until it gets done. It’s been a good app for a long while, but the way it seamlessly syncs for me now is wonderful. You enter a reminder on one device, and it’s on your other devices almost instantly. That is the differencce that makes ALL the difference for me! Can’t wait to use it in iOS 11. Stopped working 1 minute into my first use. Displays the window but you cannot enter text, add a reminder, or alter the settings. Deleting and reinstalling made no difference. Emailed their support address three days ago and have received zero response. Will be asking for a refund. Sad. I bought this app because it can sync between my Mac and iPhone via Dropbox. 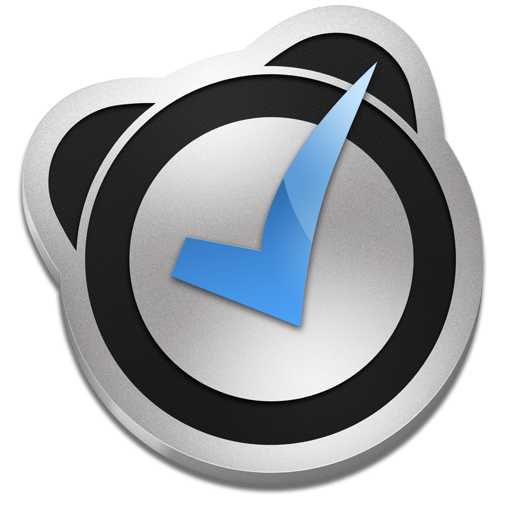 It’s a very simple task manager and does it very well. It handles natural language like “next Friday” well. My only gripe is that I’m trying to set a date for a particular Friday in a couple of months’ time, there is no drop-down calendar, so I have to guess the date & press Enter, then find out that the date I’ve picked is a Tuesday, so I have to add 3 days to it. I have tried more complex task managers, but they overwhelm me with features. This programme, with its ability to set repeating tasks & sync between platforms, does all I need. Overall this app is good, however it does insist that you put a reminder date on things immediately on adding them and the most you can default that to is one week. This is noticeable when using the drag and drop feature from mail. When reading email and deciding that I need to look at something later on I prefer to just drag and drop it to Due then. Unfortunately it stops and forces me to add a reminder date. It would be preferable if I could just leave it without a date and then later go through all those missing reminders and add them when I have a chance to think about it. This slows down how fast you can enter things and deal with the morning's incoming mail. Developer is very responsive, answering queries and recently added the drag and drop feature on request. Good effort. Would be useful if you could categorise reminders as well. Perhaps even colour coding them. I've always liked this app and and it's constant remider makes me do what I need to do! Few dissapointments with the way sync and the Mac version works, but still worth a buy. When an alarm sounds, dismissing on one device doesn't cancel them all. The iPhone app needs to open to sync, so doesn't work in an ideal way. Also when clicking on the menubar an app window opens instead of a drop down window. Small grip, but when "super quick" to do management is the claim, it's not quite as quick as others. Still the best 'To Do' app out there though IMO. Perfect for simple reminders that you don't want on your calendar - taking out the garbage, weekly routines etc. Also doubles as a nifty timer application and syncs seamlessly to the iOs app. Definitely recommended. Near perfect. I hesitated for an instant when about to buy this app, as I have been disapointed in the past. Then pressed the buy now button and have been very pleased. Simple in execution and does exactly what it claims to do. I would have given it a five star rating if not for the fact Due does not reside in the menu bar. Add this functionality and I would give it the five stars it deserves. Well done. What I like best about this app: - Focused on simplicity of UI and the essentials of a Reminders app - Allows you to use natural language to set due date/time - Nags you (autosnooze) until you take action - Allows you to quickly postpone for 10 minutes, 1 hour, or 1 day - Great syncing to use in conjunction with the iOS version. Congrats and keep up the great work! Five minutes in an it's replaced the Reminders app, my timer app, and my clock alarms. I've already set up a bunch of cooking-related timers that i'm always requiring. The ability to run several timers concurrently is going to be so, so handy (think one timer for rice, and another timer for whatever else you're cooking). So easy to use. In addition, the iOS app is universal, and adds alarm/timer functionality to the iPad (beats me why Apple didn't include it to begin with). Awesome! I've tried a lot of to do style apps and most of them are either too basic or too complex. I'm not a power user so I just want something that i can enter todo's without having to assign projects, contexts and things. This is brilliant. It syncs really fast which is something a lot of apps get wrong. Due is the first and only app I have bought from the app store on my macbook air. I set reminders for homework due dates, appointments, tests, basically everything. It takes me less than a minute to set multiple reminders and the daily reminders are amazing. I absolutely love the Due app and rely on it almost every day as a college student both on my phone and on the computer. As of late when I check something off my list on the computer it lags and takes around 5 second to process it. It seems like a minor complaint but it starts to get frustrating. Outside of that I recommend to anyone. I bought this app because the developer is the developer from the very excellent iPhone email app Dispatch. I think this app is pretty cool. I use it for timers. I hope that it continues to have good development. I like this app a whole lot, and I've tried probably a dozen or so apps that I've shoved to the side pretty quickly for one reason or another. But not with this app, and that says a lot. I really like the clean, aesthetically appealing interface, very simple, very efficient, very elegant. Really easy to add new alerts or change old ones with natural language input. The adjustments from the pop out list adequately allow me to readjust and modify with ease. I would like to see the same interface with the drop down menu as is evident in the iOS versions (icons instead of text), but the dev says it was decided against already. Maybe in the future with customer requests? Either way, keyboard shortcuts are great, too. Besides the nuts, bolts, and embroidery/interface aesthetics, syncing with the corresponding iPad and iPhone apps means that I have a very appealing, fluid, cross-platform option for times when I just need a simple alert with a time and name. Add to that custom repeating intervals and really easy natural language input, and this app is worth the price. I literally use this app all day long, and it's really great to get organized again. Due handles all of those little things that I need prodding about, but without complex GTD methodology. Lastly, I must say that the support by the developer has been extraordinary. I have had a lot of sync issues that are not common, according to the dev, but even just me as one customer, "JJ" went the extra mile, time and again, to help me out. Haven't had that kind of quality support and service probably ever. Great app! Due is seriously the best app for what it does, and the seamless iOS sync is just perfect, congrats to the developers! I have one small request though, I mainly use due for timers, would it be possible to add a setting to open due in the timers tab? I've tried several different reminder apps and Due is the only one that has met all my needs: - Repeating reminders - Specific days of the week (also repeating) - Variety of sound alerts (including custom) - Easy to use and stays out of the way unless needed (Menu Bar only option) - Integrates with Notification Center I don't use the sync function, but if I needed reminders on my phone, I wouldn't hesitate to purchase the iOS app. Here's a tip to reward those who actually read reviews: I managed to accidentally close Due a couple of times by pressing Cmd+Q when I meant to press Cmd+W. To prevent this from happening again, I remapped the Quit menu item to Option+Cmd+Q in Keyboard system preferences. Don't bother buying Due for the Mac if you use it on your phone. The iCloud sync never seems to work, which results in reminders for tasks marked complete on one's phone will still show up on one's Mac. Annoying. This app does what it says and does it in an excellent way. User-friendly interface that is intuitive and efficient to navigate. Set reminders and you know your attention will be directed to the right action at the right time. The repeat and delay features are also very well done. If only more apps were this good… I highly recommend this app and I don't say that often. I love the idea of syncing reminders, countdowns, and alarms between devices (something reminders already largely does) but paying 10 dollars is ridiculous. I bought the mac version (5 dollars) because I wanted a nice timer and was hoping it would play nice with my iPhone, but that apparently costs another 5 dollars. 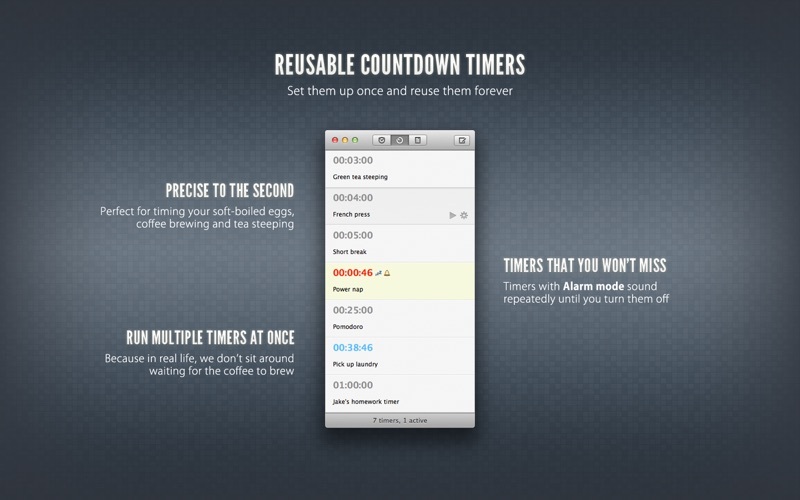 The mac version of the app doesn't do anything that reminders doesn't do with the exception of multiple timers. 5 dollars is plenty for both apps considering the mac version doesn't do anything unique. The developers are getting greedy. Is their a policy on refunds?